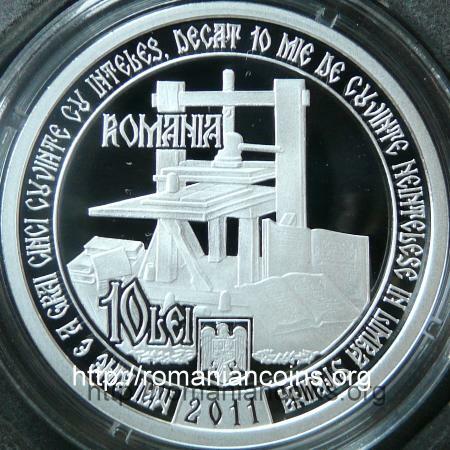 Obverse: ROMANIA, face value "10 LEI", coat of arms of Romania, year 2011 (in exergue), inner linear circle, a Gutenberg-type printing press, two books, circular inscription "MAI BINE E A GRAI CINCI CUVINTE CU INTELES, DECAT 10 MIE DE CUVINTE NEINTELESE IN LIMBA STRIINA" (a short quote from the epilogue of the Gospel printed in Romanian in 1561 by deacon Coresi, book written in old Romanian) meaning "IT IS BETTER TO SPEAK FIVE UNDERSTANDABLE WORDS, THAN 10 THOUSAND UNUNDERSTOOD WORDS IN FOREIGN LANGUAGE" Reverse: 1561 - year when the Gospel was printed and CORESI - name of the printer, an illustration from the top of a page from Coresi's Gospel - between the arms of the cross lies the Greek inscription IS HS NIKA, meaning Jesus Christ wins; circular inscription "450 DE ANI DE LA TIPARIREA EVANGHELIEI IN LIMBA ROMANA" meaning "450 YEARS SINCE THE PRINTING OF THE GOSPEL IN ROMANIAN LANGUAGE"
Coresi printed books at Tîrgovişte - capital city of Walachia - and at Braşov, where Coresi has moved after the invitation of Hans Benkner (Hanăş Beagner, mayor of the city). The Gospel (tetraevangelion) of Coresi ("ot Tîrgovişte"!, ~1510 - ~1581) is the second book ever printed in Romanian. It is the oldest book written in Romanian preserved until today - as out of the Lutheran Cathechisms printed at Sibiu in 1544 (by Filip the Moldavian) not a single copy survived to reach our times. The great merit of Coresi is the use of Romanian language - his books, that spread into all lands inhabited by Romanians, have practically marked the beginning of the literary Romanian language. 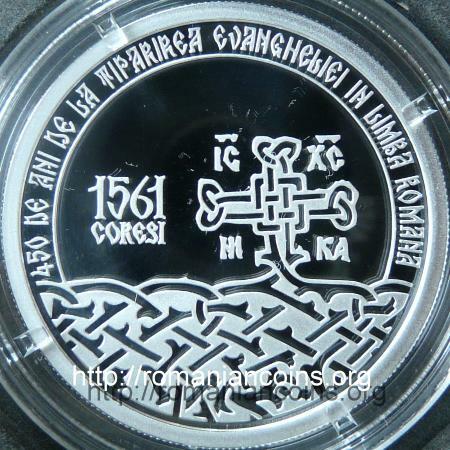 The text on the coin obverse is a fragment from the Gospel's epilogue. In fact, it is a quote from the first epistle of Paul the apostle to the Corinthians (in the Holy Bible, Jubilarian edition of the Holy Synod, Bucharest, 2001, 1 Corinthians 14, 18, the text is: "rather speak five words with my mind, than ten thousand words in a certain language"). The choice of the quote is well fitting to the coin, although it is ironically contradicting the Greek (!) miniature reproduced on it. The first book printed in Romanian territories was the Litourgicon of Macarie, dating from 1508.